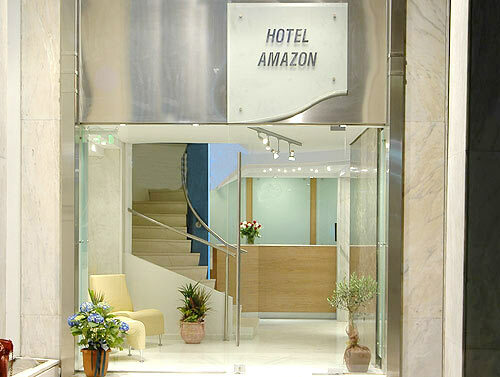 Amazon Hotel is located at Syntagma, in the center of Athens, in the scenic area of Plaka. Recently renovated, it has all modern amenities and with the particularly experienced staff, at AMAZON you will promptly feel the friendly and family atmosphere required to make your stay pleasant. The hotel has 46 completely renovated rooms, equipped with all modern facilities. The experienced staff as well as the reception of our hotel is at your disposal 24 hours a day so that you always have a pleasant stay. Furthermore, the hotel undertakes luggage safe-keeping, transportation from and to AMAZON, arrangement of small trips, car and motorbike rentals, and a massage studio (upon appointment). The cafeteria and breakfast room are on the 1st floor of Amazon Hotel. There is also a small convention room for your professional meetings. The friendly and family environment of AMAZON will provide you a pleasant stay in Athens, regardless of the purpose of your trip. Είστε ιδιοκτήτης ή διευθυντής στο AMAZON HOTEL; Εγγραφείτε τώρα για δωρεάν εργαλεία, που μπορείτε να χρησιμοποιήσετε για να βελτιώσετε την καταχώρησή σας και να συνδέσετε την ιστοσελίδα σας και το σύστημα κρατήσεών σας.